Did you know I have cats? Jon Snow and Ygritte. Yes, they're named after Game of Thrones characters because I got to name them. And they reminded me of the bold Jon Snow and fiery Ygritte from the North. Just two days ago, Ygritte surprised us by giving birth. You should have seen us freak out and run around the house. What are we suppose to do? We've never had a cat before, much less one that gave birth. Luckily, Ygritte did it herself and three beautiful kittens popped out. They are so tiny, and so fragile. We're calling them George, Fitz and Spaz. Anyway, my As Levels are just around the corner, beginning on 5th May and ending on 8th June. While I'm feeling only moderately anxious, stress levels and hair fall is increasing at a rapid rate. In all, I'm nervous, restless and a little scared. I know I shouldn't be, but still. Exam Month brings wild emotions that you can't quite shake off. So during this month of May, I decided to limit my posts to twice a week. Every Tuesday and Friday. I've experimented with this last April to mild success. I don't enjoy forcing myself to limitations but I must for the sake of my results. I've prepared a few posts ahead, and a few guest bloggers will be posting here while I'm busy crying over papers. I'm excited for you to read them! Hopefully, I'll still be able to check out and comment on all your wonderful blogs, but I might be slower and a little late to the party. For that, I'm so sorry. I love reading and commenting but I fear it would take too much of precious study time. Like this post. So this is me, saying I hope you're having a wonderful day, and good luck for anything that comes your way! Good luck with your tests...the blog will still be here when you come back so don't worry about it:) what is important is that you find a good balance between studying and resting. your cat is adorable...and I love that it is named after a character in the Game Of Thrones. Eeeek, mama Ygritte is absolutely gorgeous, and the little kittens are adorable! Have fun watching them grow up because kittens are fun, fun, fun! Good luck for your exams! Wow, I would have freaked out for sure. What are you going to do with the kittens? Keep all of them? And good luck with your exams. Those kittens are the cutest things I've seen today, I want one haha! Great names too. Good luck on your exams, I'm sure you can do it! KITTENS! I want even just one cat, and now you have many. 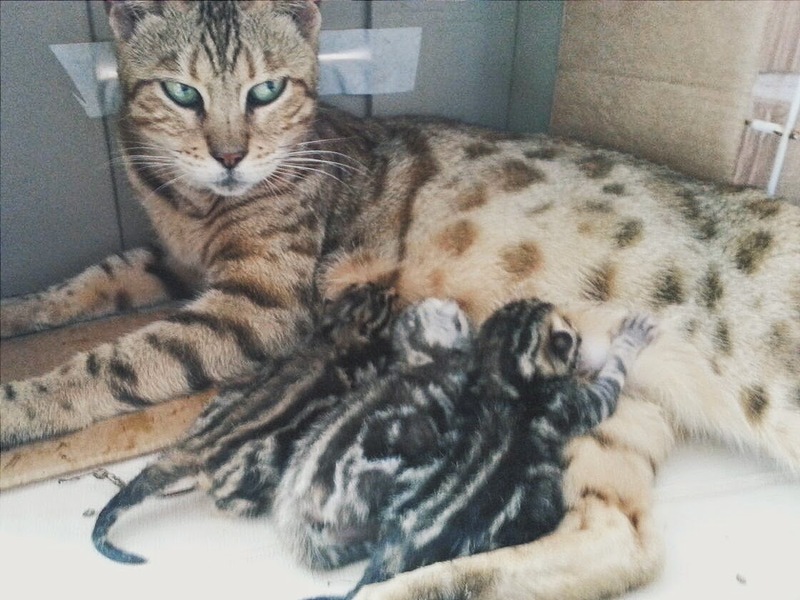 That momma cat looks like a badass. I love how you named them after GoT characters too. Good Luck with your exams! PS. I just became your 100th follower on Bloglovin'! Love the kitties :) And good luck on your exams! I just finished mine and I'm so relieved they're done. I was behind on blogging, though. Your kittens are so cute and you have a lovely mom cat. Good luck on your studies. Just remember to breathe and I am sure you will do well if you study hard. So your cats are living out the lives their namesakes should have been able to ;) haha. Good luck with your exams, I know the feeling! hehehe :) cute cats. but i freak out when i see them. not good with pets. unfortunately. Wow that must have seriously been quite the surprise! Although did Ygritte not get noticably bigger over the last month? And I guess she was not spayed so she and Jon were busy? The kittens are so cute, will you keep them? Sorry to hear about your exam stress but I am sure you will do great! And limiting the blogging is a great way to not get too in over your head but not have to abandon blogging either! Do let me know if you are looking for any more guest posters too! Good luck on your tests! I know how you feel because mine are coming too! I have to pass math exam on the 21st of may! Ahhhh! I must admit those kittens look so cute and lovely. Wish I could have one of them! All the best on your exams and don't worry about blogging, we'll be here waiting for you to come back full time! Wow, your cats are so cute! Good luck on your exams! I love cats too :) Thanks for sharing. Good luck with all your exams! Love the fact they're names after Game Of Thrones characters! So cool! Lovely post and good luck with the exams!! Congrats on the kittens too! Kitties! Lol I would totally panic if my pet started giving birth too! Omg, you called them after GOT characters! Once my cat gave birth in my duvet (it was a new cover and all folded up nicely - thank god I was out doing errands!) and I had a huge shock to see 3 kitties! I want a tortoise or owl now! OMG thats the cutest thing ive seen!! !